Our local costumed guides will enthral you with tales of life in Victorian Britain as you see the surprising sights in this unique, model industrial village built by Sir Titus Salt between 1851 and 1876. 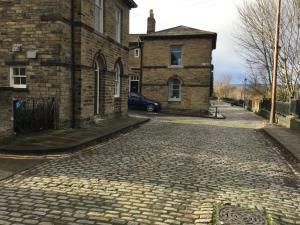 From the Italianate Grade 1 listed United Reform Church, you will stroll along the Saltaire cobbles in this World Heritage site as your guide entertains you with fact, fun and fiction with genuine Yorkshire diction! Our guests are each given an individual, handmade book mark with the history of a real person who lived and worked in Saltaire. Other surprises are revealed on the day! Our first patron, Denys Salt, great grandson of Saltaire’s founder said: “I’m particularly proud to be patron of this unique organisation. For anyone who wants to know about Saltaire I can unreservedly recommend Salts Walks & Talks.” Saltaires history is safe in their hands. From only £4.50 per person, our rates are highly competitive and we offer guided walks in English, French, German, Spanish and Italian. Walks are suitable for all age groups and everyone is welcome. Bookings are taken all year round. We operate at any time by arrangement. We are happy to do a guided walk for anyone at all at anytime.. however we have a minimum charge of £65.00 to organize a costumed guided walk. Groups anytime by arrangement competitive rates negotiable.